Our engineering Group oversees every project from concept to machining and beyond. Our expertise and experience in CNC precision machining of medium to large complex parts with Robotic integration have led to numerous trade publication articles about our unique capabilities. With ten full-time engineers on our staff, knowledge of materials, machining and machine tools, our capabilities go beyond our current customer base. Mennie's engineering knowledge and experience can help you in the design and prototype phase to optimize your parts for manufacturability; from viewing customer's drawing with Auto-CAD to creating our own fixtures at our 30,000 square foot tool room located one mile from our production facility. 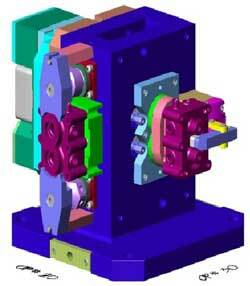 In addition, our engineering department utilizes the latest software for computer-integrated manufacturing.